The Labrador Retriever is one of the most popular dog breeds (by registered ownership) in the United States as well as in the United Kingdom. Once bred as a working dog that would use its soft mouth to retrieve fowl, the Labrador Retriever is in intelligent and energetic dog that is easy to train for a multitude of different tasks. Since it has been selectively bred for retrieving waterfowl, it loves to swim and play in water. The Labrador Retriever is commonly referred to simply as Labrador or Lab. Due to their big floppy ears that traps warm moist air, Labradors can develop ear infections. An important part of Labrador Retriever car is therefore to regularly check the ears of your dog to make sure that serious infections are given no chance of developing. If an ear turns from its normal light pink colour and becomes dark pink or even inflamed red, it is a symptom of ear infection. Brown deposits can also appear in infected ears. If this is the first time your dog develops an ear infection, it is a good idea to take it to the vet for inspection and further instructions. Most cases of ear infection will go away if you clean the ear once or twice a day. (It is very important not to force any dirt into the sensitive inner ear during cleanings.) If the infection persists, ear drops can be used. If your Labrador Retriever is highly prone to ear infections it is advisable to clip the hair around the ear and under the flap to encourage better air flow. 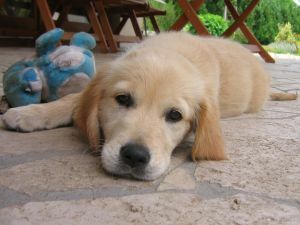 Most experts agree that a Labrador Retriever puppy should not be separated from its mother until it is 8-10 weeks old. Getting a younger Labrador Retriever puppy is therefore not recommended. Labradors mature into adults when they are approximately three years of age. Labs younger than this can have a lot of puppyish energy and are therefore sometimes incorrectly labelled as hyperactive, when they are in fact only acting out a typical lively Labrador Retriever puppy behaviour. Labrador Retriever puppies are curious and exploratory, and you need to keep a watchful eye over them – they can vanish in a second if they find an interesting scent or a person who gives them attention. When your Labrador Retriever puppy is old enough it should ideally be microchipped. Labrador Retrievers that are lost or run away tend to seek out human company very soon, and if you have microchipped your dog the police will be able to bring it back to you in no time. Microchipping will also reduce the risk of your dog being stolen and sold. A collar with name and address is much easier to remove than an embedded microchip. Originally bred to be a working dog, the Lab loves working with its owner and Labrador Retriever training is usually both easy and funny. This dog loves to please and will respond well to praise and positive attention. It is considered a sociable, intelligent and good tempered dog and can turn into an excellent companion for adults and children alike. Labradors are fun loving and explorative, and Labrador Retriever training is necessary to make sure that they understand the difference between right and wrong. If you do not spend any time training your Lab, it will naturally be impossible for it to understand which type of behaviours that are allowed and which ones that are not. According to the American Kennel Club, pedigrees exist back to 1878 and the modern Labrador Retriever is thereby one of the oldest of the modern recognized breeds. The UK Kennel Club recognized the Labrador Retriever in 1903 and the first registration of Labs by the AKC took place in 1917. Labrador Retriever breeding is believed to have started on the island of Newfoundland in North America. The Lab probably descended over time from the now extinct St. John's, a crossbreed between the Newfoundland dog and native water dogs. The name Labrador was given to the breed by the Earl of Malmesbury to distinguish it from the Newfoundland dog. The big Newfoundland dog was used for hauling, while the smaller, short-coated Labrador – also known as the lesser Newfoundland dog – was used for retrieving waterfowl and pulling nets from the water. It is always a good idea to check out several different Labrador Retriever breeders before making a purchase, because the quality of breeders and their puppies varies a lot. Since the Labrador is such an immensely popular dog, there are many low-quality breeders producing vast amounts of puppies to sell to buyers that do not know a lot about dogs. It is important to choose Labrador Retriever breeders that focus on the wellbeing of the dog. Serious breeders strive to breed out inherited disorders, and they will also take good care of both adult dogs and puppies. The Labrador Retriever is generally a healthy dog with few major health problems, but there are a few areas that must be given special attention. Labradors are somewhat prone to hip and elbow dysplasia, and you should therefore ideally choose Labrador Retriever breeders that can provide you with hip scores. Labs are also at risk of developing knee problems, including luxating patella. Other notable problems in the breed are progressive retinal atrophy cataracts, corneal dystrophy and retinal dysplasia (three different types of eye ailments), as well as hereditary myopathy, a rare but serious condition that causes a deficiency in the type II muscle fibre. The Labrador Retriever price varies significantly from breeder to breeder. A high price is naturally no guarantee for you getting a high quality dog, but really low prices should certainly be interpreted as a warning sign. 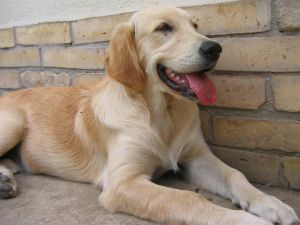 A low Labrador Retrieve price will not be low in the long run if the dog that you get is ill, improperly socialized or suffering from mental ailments.